I AM mother ocean, my love flows far and wide. I AM sacred fire, my light shines far and wide. I AM an earth person, my hands reach far and wide. I was introduced to the Pachakuti Mesa Tradition in the early nineties by two beautiful souls I much admired. They had become mesa-carriers and taught me the basics and sparked my interest in deepening my knowledge and practice via the Five-Part Apprenticeship and eventually don Oscar’s online courses. I have had the pleasure of attending a few weekend ceremonial retreats and meeting don Oscar and many more awesome community members. I am a freelance graphic designer and am also currently serving as communications director on don Oscar’s Team Stellar. I live with my husband Alan in a 107-year old house overlooking downtown San Diego. Alan gave me his first guitar long ago, but only in the last couple of years have I become motivated to learn to play it. 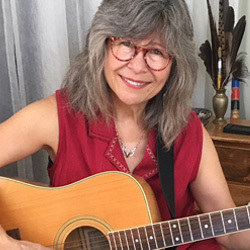 We have hosted a jam each month for years and I am grateful to Alan and our musical friends for the encouragement they have given me to grow in musical confidence, to sing and to play. This song of affirmation was inspired by Spirit and the wisdom sharing of a new moon circle of women (you know who you are) on the 2018 Spring Equinox. It has taken me some time to gratefully and humbly present it to our wider community. My thanks to Rosalyn for helping me record it in ceremony at my mesa. I have included the chords (see the pdf) for any of you who play guitar.